Dive into some ceramic chemistry today! The recipes used on this turquoise and yellow egg tray by Andrea Denniston are included below. If you’re like me, the mention of the word chemistry can send you into a panic–admittedly not my favorite subject. But I love ceramics, so I realized a while back that I had to face my fears and try to get a grasp on ceramic chemistry. Yes, a general knowledge of ceramic chemistry and glaze materials can be very helpful when mixing glazes and interpreting firing results. 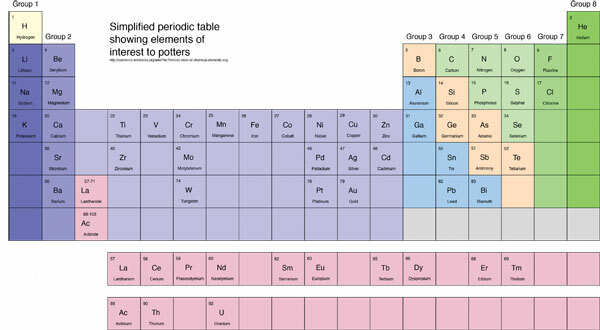 In this post, an excerpt from Science for Potters, Linda Bloomfield breaks down what potters need to know on the Periodic Table of the Elements. We also included a couple of great Cone 6 glaze recipes so you could put some of this new knowledge into practice. Get your thinking caps on! We’re going back to school! – Jennifer Poellot Harnetty, editor. P.S. For more detailed information about elements from the periodic table that are relevant for ceramic artists, atom structure, and electrons and orbitals, check out Science for Potters by Linda Bloomfield in the CAN shop. The elements were forged in nuclear furnaces inside stars. Ordinary stars like the sun burn hydrogen, two hydrogen atoms colliding together to make a helium atom and releasing energy in the form of heat and light. In dying stars, the hydrogen runs out and the helium atoms fuse together to make the heavier elements. Elements heavier than iron, such as lead and uranium, are only formed when a massive star explodes to become a supernova. The dust left from such an explosion eventually re-forms to make new stars and planets like our Earth. We are all literally made of stardust. In the ancient world, the elements, or basic constituents of matter, were believed to be earth, air, fire, and water. We now know that there are in fact more than 90 naturally occurring elements, including metals, semi-metals, and non-metals. At ambient temperature, some elements exist as gases, a few as liquids, and many as solids, but their state of matter can change with temperature. As potters we are most interested in the elements in the Earth’s crust that form rocks, as these are also the elements present in clay and glazes. The most abundant are oxygen, silicon, and aluminum, followed by iron, calcium, sodium, potassium, and magnesium (1). The periodic table explains the chemical and physical properties of the different materials used by potters (4). It is the basis for understanding the whole of chemistry. However, we are primarily interested in the elements useful to potters, which include silicon, aluminum, the alkali metals and alkaline earth metals, as well as the transition metals. During the nineteenth century, scientists began to notice that groups of elements had similar properties. Not all the elements had yet been discovered, but when they were lined up in order of increasing atomic number in seven rows, similarities between groups became clear. We know now that is because the elements in a group all have the same number of electrons in their outer shell, so they all react in similar ways. In the periodic table, the elements are listed in order of ascending atomic number. There are seven rows of elements and eighteen columns. The elements in each column, called a group, have similar properties. Important groups for the potter are group 1, the alkali metals (sodium, potassium etc. ), and group 2, the alkaline earth metals (calcium, magnesium etc.). These are used as fluxes in glazes. All the elements on the left-hand side and middle of the periodic table are metals. The ones at the bottom are known as heavy metals as they have more protons and neutrons and therefore greater atomic weights. Many of the metals discovered since the early nineteenth century have names ending in ‘-ium’, for example, sodium, calcium, barium. Their oxides form alkaline solutions when dissolved in water. The oxides, rather than the metals, are of most interest to the potter as they are the constituents of clay and glazes. Gain a better understanding of glazes! John Britt's video Understanding Glazes demystifies the complex topic of glaze chemistry. Starting with glaze testing—because testing is key to understanding ceramic processes—John explains various testing methods that will help you get great results quickly. Then he geeks out on how various ceramic materials work together to produce myriad outcomes. Watch this video and take control of your glazes! The central block of the periodic table contains the transition metals. These can have several oxidation states and are important in producing colored glazes, particularly the metals along the top row: chromium, manganese, iron, cobalt, nickel, and copper. The two rows inserted at the bottom are known as the lanthanides and the actinides, and some can also produce colors in glass and glazes. Uranium is the heaviest naturally occurring element and can produce yellow in glazes, although it is no longer used owing to its radioactivity. The elements beyond uranium can only be synthesized in nuclear reactors and decay radioactively into other elements. Lead is the heaviest stable, non-radioactive element. On the right-hand side of the periodic table is a diagonal line, which divides metals from non-metals. The elements on this line include boron, silicon, and arsenic. They are known as metalloids and are semiconductors, which means they will only conduct electricity under certain conditions. Silicon is the basis of modern electronics and computers. Some of the elements most useful to potters also lie on or near this dividing line and include silicon and boron, which are both glass formers although the latter is mainly used as a flux in low-temperature glazes and in heat-resistant borosilicate glass. Aluminum is next to silicon, found in clay and used as a stabilizer in glazes, preventing them from becoming too runny when fired. On the right-hand side of silicon is phosphorus, used as a flux in glazes and in bone china. Antimony and selenium are used in small amounts as yellow and red colorants in glazes. The top right-hand corner of the periodic table contains oxygen, the halogens fluorine and chlorine, and the noble gases helium and neon. Oxygen is present in all clay and glazes, usually combined with silicon and aluminum as oxides. Fluorine is of interest to the potter, as it is often given off in the kiln from decomposing fluorspar, a mineral found in Cornwall Stone. The far left of the periodic table is highly alkaline and the right is highly acidic. The strength of the alkali decreases from left to right, while the strength of the acid increases. For example, along the third row, sodium oxide (Na2O) is highly alkaline, magnesium oxide (MgO) is alkaline, aluminum oxide (Al2O3) is amphoteric, silicon dioxide (SiO2) is acidic, and phosphorus pentoxide (P2O5) is highly acidic. In ceramic glazes and vitreous ceramic clay bodies, the alkaline and acidic oxides react together and melt. The alkaline metal oxides are fluxes, which react with the acidic glass former, silica. The elements in the central block are amphoteric (able to react as an acid or base/alkaline), although many show slightly alkaline or acidic properties. Their oxides are used in glazes as supplementary fluxes, stabilizers, opacifiers, and colorants. Andrea Denniston’s egg tray with above glazes. acid, alkaline, bone china, clay, element, fluorspar, glass former, iron, oxidation, periodic table of the elements. Thank you for this ceramic perspective. I can’t wait to read the full article to help me with glazes. @ Candace and Jan – You should be able to print any web page through your browser’s print function. Just go to File > Print, or hit control P. We took the images out of the slide show so you should be able to print them all now. – eds. Where is the ‘PRINT’ button? ANd how does one print when the images are in a slide show? Please improve. Huh? No mention of our friend Lithium for which there would be no spodumene. Or any of the Lithia glaze components! Our funny little reactive fluxy friend falls just between hydrogen & sodium in the first column on the far left! HI, Where is the print button. And without the print button how does one print when there is a slide show of the content. Printing from the screen does not allow the content of the slideshow to be printed. Please inform.